As Fall moves along I find my tastes tending toward warm gooey, yet seasonal things. Last week, a friend reminded me about it being Grilled Cheese Sandwich weather. Have been cruising Pinterest and by gosh, I am not alone! Tastespotting which bills itself as a community driven visual potluck - what an appropriate resource for our area! - had this luscious Green Goddess Grilled Cheese. 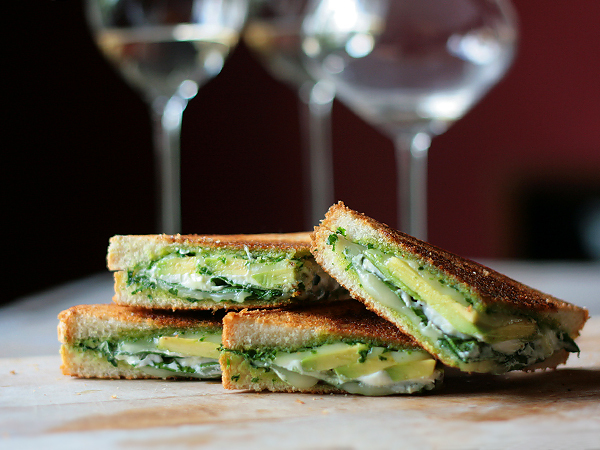 and then use a melty cheese like mozarella with layers of spinach leaves and avocado. when one thinks (seasonal foodwise) of the Island, Door County and cool, crisp weather one thought that comes to mind is Apples - there are many types along the roads for sale right now. and there is cinnamon and brown sugar involved. This version comes all the way from a Boston site - I guess they like apples there, too! Becoming familiar with Pinterest is a new adventure for me and I must say it is fun! The possibilities for grilled cheese are endless ... just think about it and if you are on the Island and the store has closed, open the refrig and check the cupboard and see what is on hand. Start to construct your version. Healthy? Not so? What will your creation be? Now my husband, Lew, would think these ideas are a travesty. The only option in this category for him would be traditional grilled cheese (which he makes really well!) served with that well known tomato soup with which we all grew up. Come to think of it, this continues to be a great option for the little ones as well as the big ones in the family. Apples? ...... Did I say Apples? That reminds me .... I know the Farm Museum publicizes their Saturday/Sunday October 6/7 event as a Cider Pressing Party but the best part (as far as I am concerned) are the taffy apples. I can make a whole meal out of one and we get to dip our own - with or without nuts, you choose. Linda Taylor, the Apple Lady in charge, tells me she has over 800 apples ready and about 130 pounds of caramel on hand for the two day event. The line can be long but it will be worth the wait. The party runs from 10:00 am to 4:00 pm. A visit to a Farm of yesteryear with taffy apples, children's games, cider pressing, farm animals, and more. Save time in your weekend to be there! "A Grain of Truth" - Washington Island Makes ForbesLife Magazine. I stopped in to Paint Box Gallery in Ephraim last Thursday to get two watercolors reframed and in passing, Carol Gresko, the proprietor, mentioned seeing an article which highlighted Death's Door Spirits' Brian Ellison and the company's White Whiskey in the September 24 issue of ForbesLife. The article can be accessed on that magazine's website although I didn't see the accompanying photo - and it's a nice one. Not sure what your tastebuds are favoring right now but I hope you take advantage of what the season has to offer. PS Have you bought your tickets for the Washington Island Fire Department Benefit? Great prizes for a good cause. The WIFD Open House is set for Saturday, October 6 from 10:00 am to 2:00 pm. PPS * Shoreline photo by Pam DeVos.